You need to sign in if you're already a member. By entering this giveaway you will become a member of My Military Savings. Phone number will only be used to contact winners for prize fulfillment. NO PURCHASE OR PAYMENT OF ANY KIND NECESSARY TO ENTER OR WIN. A PURCHASE WILL NOT INCREASE YOUR CHANCE OF WINNING. SWEEPSTAKES ENTRY PERIOD BEGINS APRIL 16, 2019 AT 12:00AM AND ENDS MAY 15, 2019 AT 11:59PM EST (THE “CONTEST ENTRY PERIOD”). CONTEST ONLY OPEN TO LEGAL CITIZENS OF THE UNITED STATES RESIDING IN THE 50 (UNITED) STATES OR SERVING ABROAD, THE DISTRICT OF COLOMBIA AND/OR PUERTO RICO. PLEASE DO NOT ENTER IF YOU ARE NOT A VALID ACTIVE DUTY, RESERVE, GUARD, RETIREE OR FAMILY MILITARY MEMBER OF THE UNITED STATES OF AMERICA AGES 18 AND OLDER. VOID WHERE PROHIBITED. HOW TO ENTER: NO PURCHASE NECESSARY TO PARTICIPATE IN SWEEPSTAKES. Visit www.MyMilitarySavings.com (the "Web Site") during the Sweepstakes Entry Period and click on the icon, banner or text link to access the Sweepstakes entry page. Follow the online instructions to complete the Official Online Entry Form and submit as instructed to register for the Sweepstakes; entrants will have a chance to win a $50 Exchange gift card. 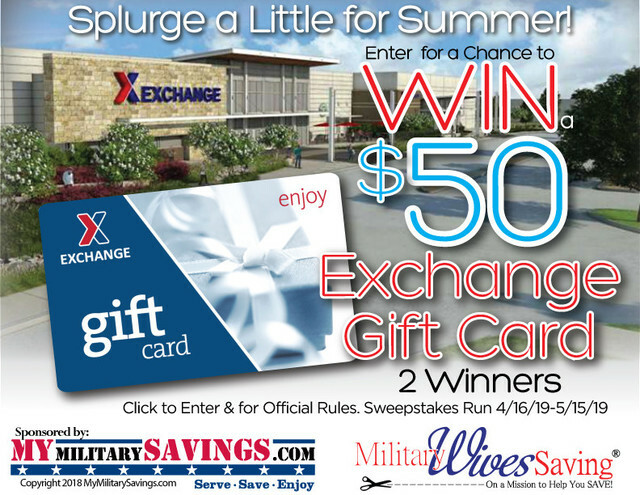 Online entries for the Sweepstakes being sponsored by MyMilitarySavings.com must be received by no later than 11:59 p.m. EST on MAY 15, 2019 to be eligible to win. Limit ONE (1) online entry per name per e-mail address for the Sweepstakes duration. The MyMilitarySavings.com computer is the official time keeping device for this contest. Proof of e-mailing does not constitute proof of delivery or entry. Any attempt to submit more than the maximum number of entries using multiple/different email addresses, identities or any other methods may void that entrant’s entry. Entries generated by a robotic, programmed, script, macro or other automated means will be disqualified. No other forms of entry are valid other than those set forth above. All entry information becomes the property of the Sponsor. PRIZES: There will be a total of ONE (1) Prize Winner drawn from the pool of qualified entrants. ONE (1) winner will be selected on or about May 16, 2019; the winner will receive ONE (1) $50 Exchange gift card. Odds of winning a prize depend upon the number of entries received. If a prize offered becomes unavailable for any reason, the Sponsors reserve the right to provide an alternate prize of equal or greater value. DRAWING: The winners will be drawn from among all eligible entries received. Winners will be announced on or about May 16, 2019. The drawing will be conducted by a representative of www.MyMilitarySavings.com whose decisions are final and binding. ELIGIBILITY: Sweepstakes open only to legal citizens of the United States residing in the 50 United States or serving abroad, District of Columbia and Puerto Rico who are 18 years of age or older on the date of entry. PLEASE DO NOT ENTER IF YOU ARE NOT A VALID ACTIVE DUTY, RESERVE, GUARD, RETIREE OR FAMILY MILITARY MEMBER OF THE UNITED STATES OF AMERICA AGES 18 AND OLDER. VOID WHERE PROHIBITED. Employees, officers and directors of Sponsor, www.MyMilitarySavings.com and all of their respective parents, subsidiaries, divisions, affiliates, suppliers, printers, distributors and advertising, promotional and judging agencies, (and their respective IRS dependents, immediate family members [parents, children, siblings and spouse]) and individuals residing in their same household (whether or not related) (collectively, “Sponsor and Promotion Parties”) are not eligible to participate or win. WINNER NOTIFICATION: Potential winners will be notified by email at the address provided at the time of entry. If winner notification is returned as undeliverable without a forwarding address or if winner is found to be ineligible or otherwise not in compliance with these Official Rules, prize will result in forfeiture and an alternate winner may be selected. If applicable, allow four weeks for delivery of prize following completion of notification process. Prize(s) will only be delivered to addresses within the United States. CONDITIONS: All entrants, as a condition of entry into the Sweepstakes, agree to release Sponsor and Promotion Parties from and against any and all liability, claims or actions of any kind whatsoever for injuries, damages, or losses of any kind to persons including death or property which may be sustained directly or indirectly with the receipt, ownership, use or misuse of any prize awarded, or while preparing for, participating in or traveling to or from any prize-related activity or for any typographical or other error in these Official Rules or the announcement of offering of any prize. The winner(s) shall bear all risk of loss or damage to their prize after it has been delivered. Sponsor makes no representations or warranties of any kind concerning the appearance, safety or performance of any prize. Except for residents of Tennessee and where prohibited by law, winners grant to Sponsor the right to print, publish, broadcast and use worldwide in any media now known or hereinafter known the winner’s name, address, voice, statement, picture or other likeness, without additional review, notification or compensation, for public relations, advertising and promotional purposes as may be determined by Sponsor. LIMITATIONS OF LIABILITY: Sponsor assumes no responsibility for: (a) lost, illegible, late, misdirected, or incomplete, entries or email; or for interrupted or unavailable satellite, network, server, Internet Service Provider (ISP), Web site, telephone or other connections, availability or accessibility, or miscommunications, or failed computer, satellite, telephone or cable transmissions, or lines, or technical failure or jumbled, garbled, corrupted, scrambled, delayed, or misdirected transmissions, or computer hardware or software or telephone malfunctions, failures, or technical errors or difficulties, or other errors of any kind whether human, mechanical, electronic or network or the incorrect or inaccurate capture of entry or other information or the failure to capture, or loss of, any such information; and (b) any incorrect or inaccurate information, whether caused by Web site users, or by any equipment or programming associated with or utilized in this Contest; any error, omission, interruption, deletion, defect or delay in operation or transmission, communications line failure, theft or destruction or unauthorized access to, or tampering with or hacking of the Web site. Sponsor reserves the right, at its sole discretion, to disqualify any individual it finds to be tampering with entry process or operation of the Sweepstakes or Web site, to be acting in violation of the terms of the Web site or to be acting in a non-sportsmanlike or disruptive manner, or with intent to threaten, abuse or harass any other person. Sponsor is not responsible for injury or damage to entrants’ or any other person’s computer related to or resulting from participating in this Sweepstakes or downloading or copying materials from or use of Web site. If, for any reason, the Sweepstakes, in the sole opinion of Sponsor, is not capable of running as planned by reason of infection by computer virus, worms, bugs, tampering, hacking, unauthorized intervention, fraud, technical failures or any other causes which, in sole opinion of the Sponsor, corrupt or affect the administration, security, fairness, integrity or proper conduct of this Sweepstakes, Sponsor reserves the right, at its sole discretion, to cancel, terminate, modify or suspend Sweepstakes, and determine winner from Internet entries received prior to action taken, or as otherwise deemed fair and equitable by Sponsor. In case of dispute, authorized subscriber of e-mail account used to enter at actual time of entry will be deemed to be the entrant’s, and must comply with these Official Rules. The authorized account subscriber is deemed to be the natural person who is assigned an e-mail address by an Internet Access Provider, on-line service provider, or other organization that is responsible for assigning e-mail addresses. It is solely the responsibility of the entrant to notify Sponsor in writing if the entrant changes his or her e-mail address during the Sweepstakes Period. DISPUTE RESOLUTION: Except where prohibited, by participating, entrants agree that all issues and questions concerning the construction, validity, interpretation and enforceability of these Official Rules, or the rights and obligations of entrant(s) and Sponsor, shall be governed by and construed exclusively in accordance with the laws of the Commonwealth of Pennsylvania without giving effect to any principles of conflicts of law of any jurisdiction and that: (a) any and all disputes, claims and causes of action arising out of or connected with this Promotion shall be resolved individually, without resort to any form of class action; (b) any and all claims, judgments and awards shall be limited to actual out-of-pocket costs incurred, including costs associated with participating, but in no event attorneys' fees; and (c) under no circumstances will any entrant be permitted to obtain awards for and hereby waives all rights to claim punitive, incidental and consequential damages and any other damages, other than for actual out-of-pocket expenses, and any and all rights to have damages multiplied or otherwise increased. WINNER’S NAME: Winner will be required to email their first initial, last name, hometown and state to info@mymilitarysavings.com to claim and receive their prize. SPONSOR: MyMilitarySavings.com Inc., P.O. Box 182110, Coronado, CA 92178 [www.mymilitarysavings.com.com].